Torrent - Kaspersky Total Security / Internet Security / Antivirus (2017) 17.0.0.611 (d) Final By Iambidyut | Team OS : Your Only Destination To Custom OS !! Kaspersky AntiVirus 2017 is an antivirus protection software, that effectivelly defenses your PC from malware. By combining cloud based functionality and powerful security technologies that run on your PC, Kaspersky AntiVirus 2017 delivers essential security against today’s threats. The cloud-based Kaspersky Security Network gathers data from millions of participating users’ systems around the world… to help defend you from the very latest viruses and malware attacks. Potential threats are monitored and analysed in real-time, and dangerous actions are completely blocked before they can cause any harm. Advanced anti-phishing technologies proactively detect fraudulent URLs and use real-time information from the cloud, to help ensure you’re not tricked into disclosing your valuable data to phishing websites. The URL Advisor also adds colour coded tags to all web links – to advise you of the danger level of the link and subsequent pages. Kaspersky Internet Security 2017 provides award-winning security that’s customized to your everyday devices. Whether you connect with a PC, Mac, Android tablet or smartphone, Kaspersky’s advanced real-time technology gives you an easy, worry-free experience that moves as fast as the web can take you. Whatever device you’re using, you’ll get immediate scanning of all applications and files that you open, save or download from the web. Potential threats are monitored and analyzed in real-time and dangerous threats are prevented before they can cause harm. Plus new Change Control helps to prevent unwanted updates or changes to your PC browser settings, including the installation of adware, toolbars, and more. 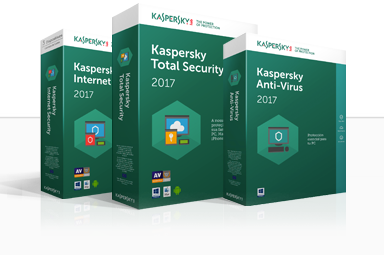 Kaspersky Internet Security 2017 allows you to conveniently secure any combination of your PCs, Macs, Android tablets and smartphones with one activation code. It won't accept key for Total Security. I extracted kaspersky TS and followed instructions, but it won't accept it. One for antivirus works fine, though.